While strolling around Lofou, you will, among others, come across the old Primary School, a beautiful stony building which used to be vibrant with children’s voices up until 1973. 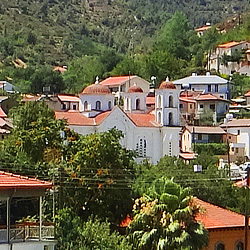 In the school yard there is a bust of Ioannis Stavrianou, a fighter of 1821, as well as a statue of Elias Kannaouros who fell in battle during the Turkish invasion of 1974. Today, efforts are being made by the Ministry of Education and by other organised parties concerned with education for the school building to be exploited. At the same time, cultural and artistic events of the Community and the Association of Expatriates take place in the school yard. Lofou walking trail begins just a few meters north of the building area of Lofou towards Sylikou village. It covers a distance of about a kilometer and follows a downhill course towards the traditional faucet of Elitji, where the villagers of Lofou used to get their water in older times. On the faucet, which is at the end of the route, there is an inscription dated 1842, which proves the date that the faucet was built. The trail is located south of a small stream which flows with water only during the winter months. This phenomenon creates a micro-system along the walking trail somewhat different to the rest of the region. 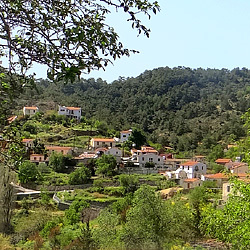 Here the walker may admire various species of Cyprus flora and fauna such as tall shrubs and oaks as well as many herbs. 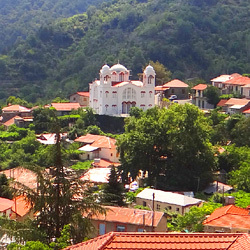 The walking trail has special aesthetic value for both the residents and the visitors of the village. Many of them usually take the opportunity to visit it in order to relax and escape from the daily routine. 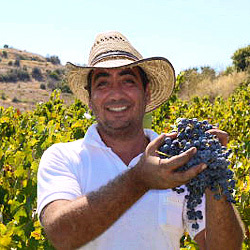 The cultivation of vineyards constituted one of the main occupations of the Cypriots from older times until today, and it was closely connevted with their life, customs and culture. 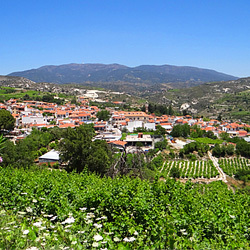 Of course Lofou, one important wine village of the “ampelochoria” area of the Limassol district, could not be an exception of the rule. The soft climate and the territorial conditions were ideal for the growth of vineyards. 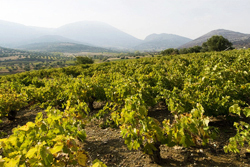 The local wine of Lofou was famous all over Cyprus for its excellent quality. 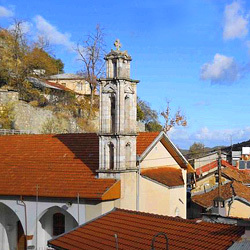 It would be remiss not to mention the amazing view of the village in the old times, when the vineyards were blossoming and the green color was prevailing in the horizon. 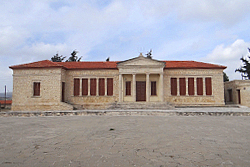 The ‘faucet of Elitji’ is located approximately one kilometre northeast of Lofou half way towarch Sylikou. The faucet owes its name to the homonymous region. The source that was supplying water the faucet is at the base of a steep mountain. The people of Lofou built a large tank of water in front of the source. The tank is decorated beautifully with big windows, from which the residents of Lofou were getting water. The whole project regarding the construction of the building was completed in 1842. The faucet served the water needs of Lofou residents until 1953, the year in which the British concreted faucets in various parts of the village. 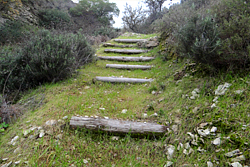 Today visitors may go to the ‘faucet of Elitji’ either from the dirt road Lofou – Sylikou, or the walking trail that has been created recently by Lofou Community Council. It is also worth noting that Lofou Community Council has recently constructed a nice patio in front of the ‘faucet of Elitji’, so as to serve the people who visit the faucet and those who enjoy the walking trail. 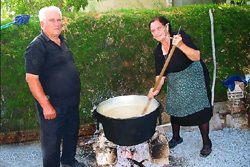 The Community Council and the Lofou Association of expatriates organizes every year in September, the Palouze Festival in the courtyard of the elementary school. 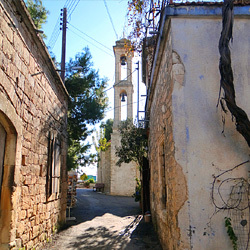 The aim of the festival is firstly the promotion of Cypriot rural heritage and rural revitalization and other community support. The visitors can taste Palouze for free. At the festival you can also see folk craftsmen, potters, woodcarvers, exhibiting their traditional creations. For the children there is a work corner which provides special moments and the opportunity to ride on donkeys. This is a classic Cypriot dessert of grape must thickened with flour.Traditionally this is made during September and October using the must (pressed grape juice) from the grape harvest. 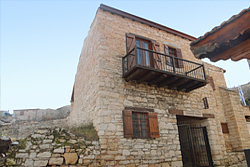 The Community Guesthouse is a picturesque stony building. It is the ideal accommodation for anybody who wishes to spend one or more nights in the beautiful community of Lofou and experience something unique. 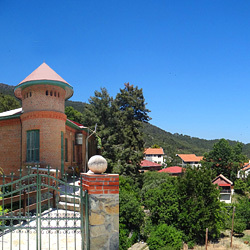 The guesthouse can accommodate up to 28 guests. It can be a place of stay for groups of pupils, students, excursionists and members of non-government organisations. 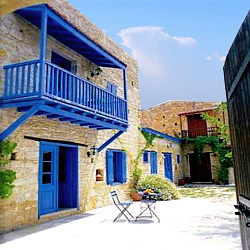 The guesthouse consists of six bedrooms with two or three berths. Therefore, each room can accommodate between four and six people. All bedrooms are en-suite and equipped with a heating and air-conditioning system. The kitchen is fully equipped so that visitors can prepare breakfast, lunch and dinner. In the dining room there are rectangular tables with traditional wooden chairs. 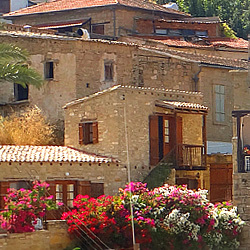 Usually, guests resort to the local taverns for lunch and dinner. The guesthouse offers various entertainment areas, an internal yard and a specially shaped room. The first entertainment area, the internal yard, offers a patio with a traditional small oven. A lot of daily and night gatherings take place there. The second recreation area is equipped with a 46'' TV, a DVD player, board games and five computers with a wireless internet connection. 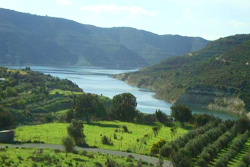 The island’s largest dam, Kouris, on the north west of the southern coastal town of Limassol, has a storage capacity of 115 million cubic metres. 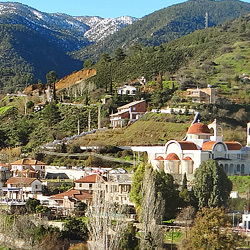 The Cyprus Water Development Department has proceeded to control the outflow of significant amounts of water from the dam, to help enrich the aquifer of Akrotiri, on the southern coast. The dam, whose construction finished in 1988 in the Limassol area, overflowed for the first time in 2004. The chapel of the Holy Fathers in Lofou was built with the initiative of both the Lofou Community Council and the Lofou Ecclesiastical Committee. It is a very small building, measuring just four square meters, and is located northwest of the village, less than a kilometer from the traditional core of Lofou. 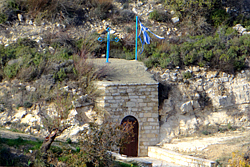 In the area where the chapel now stands, was the cave of the Holy Fathers. 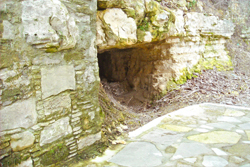 Pottery and human bones were found inside the cave during the construction of the chapel. In this cave existed for decades a candle, which was lit systematically by the villagers of Lofou. 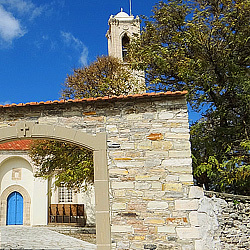 Although small, the chapel of Holy Fathers is filled with icons of Saints and Fathers of the Orthodox religion. The icons were donated to the chapel by many devoted people of Lofou. The many icons in such a small space create a sense of religious devoutness to the followers. The priest performs community vespers in the chapel once a year in the eve of the feast of the Holy Fathers on the 14th of October. 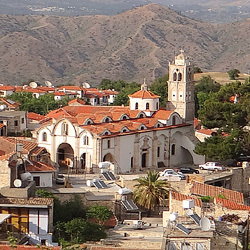 The ‘cave of Hatjiroussos’ is located in the center of the traditional core of the village at the base of a steep hill. It is an impressive perimeter cave with a depth of about 10 meters and a height of about two meters in a total area of about 60-70 square meters. 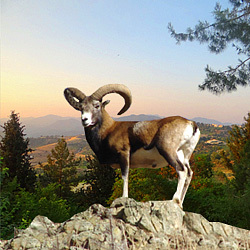 The cave got its name from the homonymous family that first inhabited in its place. It is said that the Hatjiroussos family was the first to reside in the current position of the village of Lofou. This is estimated to have occurred during the Ottoman rule. Today the cave has been preserved partly by Lofou Community Council. 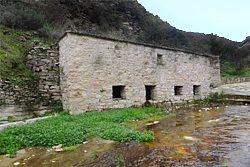 The maintenance work has, however, paused in order for the cave to be scientifically investigated by the Geological Survey Department of the Republic of Cyprus. At first sight, it appears that the ‘cave of Hatjiroussos’ is a monumental place that may be used in order to witness the lifestyle of the people of Lofou in older times.